Fourth Row Center: Film Writings by Jason Bailey: In Theaters: "This is Not a Film"
It seems silly to note that not much happens in a picture with a title like This is Not a Film, but there you have it. To clarify: not much happens on-screen. The documentary’s actual content, what it is about, reaches beyond the small scope of the action contained in its 75 minutes. The trouble is, those two threads—what it is about, and how it is about it—are not intertwined firmly enough to fully sustain our interest, even for its slender running time. It is more successful at conveying what it wants to do than it is at actually accomplishing it; it is a film that I admire, but am not enthusiastic about. We are struck, immediately, but the opening shot’s look, color, and framing, which all indicate a home video. 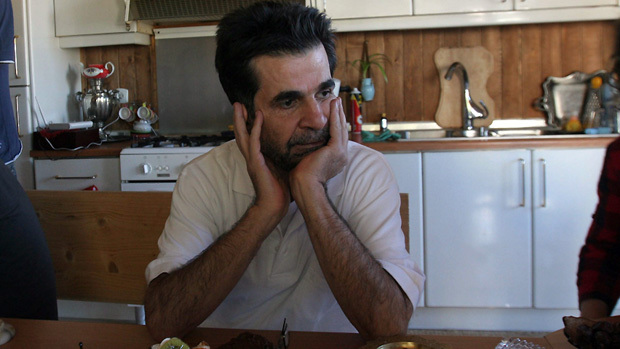 Iranian filmmaker Jafar Panahi sits in the frame; he eats his breakfast, checks his iPhone, calls a friend. 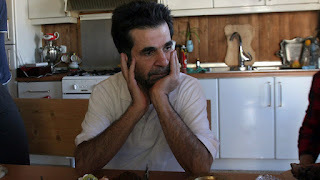 The friend is fellow filmmaker Mojtaba Mirtahmasb, who is coming over with his camera to spend the day with Panahi. Soon after he arrives, he eavesdrops on a phone call from Panahi to his lawyer, and piece together what has happened: the director has been banned, for 20 years, from making films, and is facing several years of jail time. The sight of a director explaining a narrating an unmade film presents something of a challenge in terms of audience attentiveness, and that is a challenge that the film doesn’t always conquer. Panahi walks through a bit of the narrative before asking with a shrug, “If we could tell a film, then why make a film,” and he stops (not a moment too soon). He hangs out for a while; he plays with his child’s pet lizard (which proves an entertaining diversion). He takes another phone call, and he watches TV. “I don’t know what we’ve been doing,” he admits to Mirtahmsasb towards the end of the film. It’s not an unreasonable declaration. The sound of gunfire and explosions is heard outside, increasing and frequency and intensity throughout the day (and the film). There is a whole world going on outside of this apartment, but we’re given precious little understanding of it—or of how the man we’re watching fits into it. Perhaps a standard, boilerplate documentary about Panahi—his career, his case, how he ended up where he is—would have challenged no one, and this more experimental approach was the only one that interested those involved. But This is Not a Film mostly spins its wheels and tries our patience. It is a valuable document, and an intriguing dispatch from behind a seemingly impenetrable wall. But the title is more accurate than was presumably intended. "This is Not a Film" is out today in limited release.